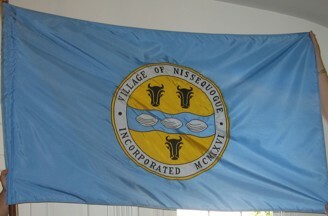 From personal observation, the flag of the Village of Nissequogue, in the Town of Smithtown, Suffolk County, NY is the village seal on a light blue field. The seal has a voided outer ring with the words Village of Nissequogue New York, and the area inside the ring is golden, with a wavy blue band bisecting it horizontally. On the golden area are three bulls heads, arranged 2 and 1, and on the band are three clams. The seal can be seen on the police patch at www.pdworks.com/suffolk/nissequogue.jpg.